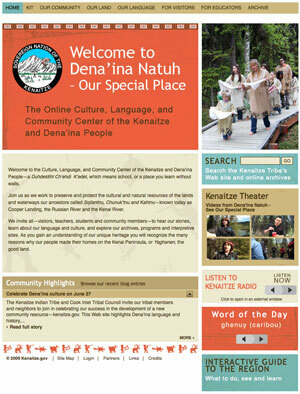 "Welcome to the Culture, Language, and Community Center of the Kenaitze and Dena'ina People�a Duhdeldiht Ch�ehdi K�edet, which means school, or a place you learn without walls. Join us as we work to preserve and protect the cultural and natural resources of the lands and waterways our ancestors called Sqilantnu, Chunuk�tnu and Kahtnu�known today as Cooper Landing, the Russian River and the Kenai River. We invite all�visitors, teachers, students and community members�to hear our stories, learn about our language and culture, and explore our archives, programs and interpretive sites. As you gain an understanding of our unique heritage you will recognize the many reasons why our people made their homes on the Kenai Peninsula, or Yaghanen, the good land." Ambalogic worked alongside the tribe, developers, and other experts in creating a rich web experience that spoke to the tribe's need to create an online community center that focuses on the land, language, and people of the region through rich imagery, video, and audio.